Questions about the Yale YH-CB-80 ? 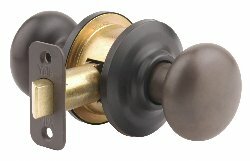 A refined half-round knob offers superior functionality in a Grade 2 Knob. As with any YH Collection Product, the 19th century legacy of Linus Yale lives on in distinctive design, high manufacturing standards, and demanding performance for the homeowner. Dummy - For doors where only pull is required.